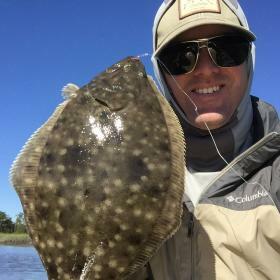 Did the hurricane mess up the flounder migration or will this cool weather get them moving and into the river or did I miss it all together? Make the forum great again.....consolidate general fishing with for sale or business but keep reports separate! The only one I've boated in the past few weeks actually ate a small fly. Nice fish but he wasn't willing to tell me where all his friends were hiding. Found him way back in a creek on the beginning of the incoming tide. I move to Brunswick in October No flounder pron coming from me this year. LOL Jimmy. BBR, I was on vacation last week and caught about a dozen flounder up to around 19 inches long. Fished from the Ferry back to Dames Point Bridge. seems to not be a thick run this year then or it hasn't happened yet. With this cool weather I figured they would start staging and stacking up in the river. there was the best spring run I have ever seen, so maybe they ran early. maybe....I kind of thought the spring run was them coming back in?